Lugh 3 weeks, 5 days ago. My question is this – and I’ve done a Lounge search and found nothing! – when I get an email newsletter, eg from New York Times, and I click on the email in my (“Unread Email”) list, I get a Kaspersky window as attached. I click “disconnect”, usually. I’ve sent an email to NYT about it but no reply. I think it’s happened with another source, too, but I can’t remember what source. So what can I – or you – do to resolve this problem? Mojn Ltd. provides a channel for e-commerce businesses to send personalized emails to the existing customers. Its product integrates with existing email providers and automatically inserts personalized email template for specific user segment. Mojn Ltd. was founded in 2013 and is based in Copenhagen, Denmark. As of December 10, 2015, Mojn Ltd. operates as a subsidiary of LiveIntent Inc. 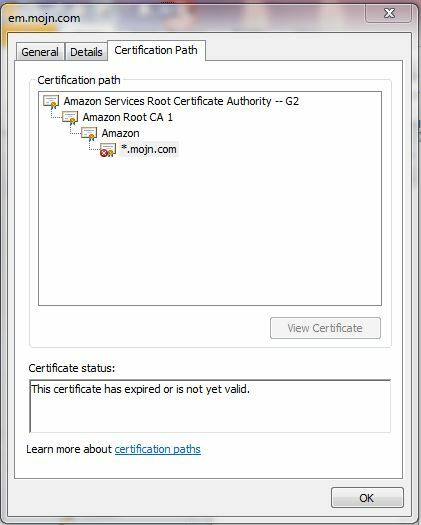 Anything useful if you click Details or View certificate at the bottom? This is what I get when I click “Details” on the Kaspersky window. I think it’s probably not worth worrying about, unless/until you get a response from NYT. You may just be missing a “Dear Mike” at the top or similar personalization in their emails. … I thought that the “recommended secure” method was to disable autoloading of external linked media in emails and just live without those embedded images and such? Because of both several security holes in the email formatters in various mail applications (potentially sending email content back to the server) and privacy (whoever controls the server gets logs of where and when, possibly also how, the content was accessed). So how do I “disable autoloading of external linked media in emails”? There are instructions for various versions of Outlook within How to Prevent Outlook From Downloading Images Automatically . You are correct, that is recommended. You don’t have to live without, though. On top of each email, there’s a panel with various options, one of which is ‘Download pictures’. Click that when the images are useful. I set my firewall to block any connections to mojn.com. Problem solved. 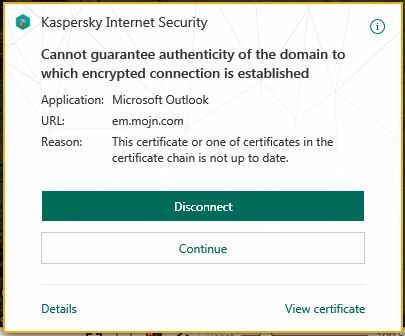 How do I set my firewall – Kaspersky – to block this? 1. Open it up and look around the menus for likely words like ‘block’ or ‘exclude’. 2. Check Kaspersky docs or FAQs.